Let’s face some of us just do not like change. This is evident in our family especially at Christmas. Keep the antipasto! is the chant we hear when it comes time for us to plan our holiday dinner. 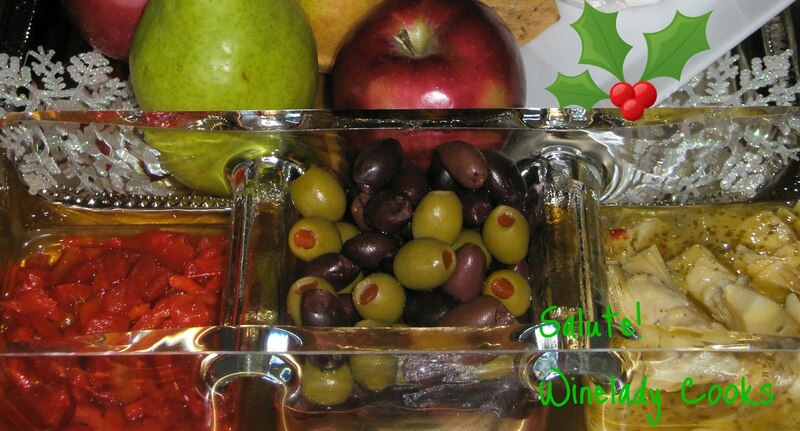 In our family an antipasto platter has always been served before our Christmas dinner as far back as we can remember. Now, this part of our meal makes us feel like time has stood still. One thing we can count on with an Italian antipasto platter is the salty and acidic elements in many of the items included in the platter. The olives, anchioves, the cured meats, and the vinegar peppers just to name a few, all have those elements. One tip to keep in mind when serving salty foods is to choose a wine that is fruity and is high in acidity. Pinot Grigio, Orvieto, Sauvignon Blanc, and rosé wines are crisp and acidic wines to have on hand for those food styles. These wines can also be served with dinner when the accompanying sauces or sides have a salty or acidic elements. What is not always a good pairing generally are red wines which have more tannins and are higher in alcohol. These elements in red wine will enhance the salt making the food taste more salty which can be unpleasant. If you prefer red wine then choose one that is a lighter and fruity wine. Gamay or Beaujolais are fruity reds that have more acidity and are lower in tannins. Pinot Noir is a very food friendly red wine. Choose a ‘new world’ style pinot which is more ‘fruit-forward’ as opposed to ‘old world’ pinot noir which has only subtle fruit character. Also, sparkling wines are always a good choice. They are very food friendly. Keep a bottle or two on your shelf for those times when you are not sure what to drink or when you want to feel special for any reason. They are inexpensive and should be enjoyed anytime.